What are the Classifications of living things? The Song for this one is found on the same video I posted on Cycle 1 Week 1's Science Section. We used the same tune from last week but we didn't have a video for it. We just made it fit. After reviewing the definition of a preposition I gave them the first set of prepositions to memorize. Here is the video we used to help memorize the 3's and 4's skip counting. This week we did Lesson 2 in Prima Latina by Leigh Lowe published by Memoria Press. For the sake of not committing copyright infringement I am just going to give a brief description of what we covered in there. This weeks lesson focused on Pronunciation of Latin Consonants. It also went over Latin Diphthongs. For those of you who don't know a dipthong is sometimes two letters that have only one sound. But it was really interesting that by learning this concept in Latin my children who usually struggled identifying a diphthong before now understood the concept really well. I truly am starting to believe those folks who say the best way to learn English Grammar is to take a foreign language. I believe I heard Andrew Pudewa from IEW say that on an audio download before. We also went over some new vocabulary words and the English Derivatives as well as starting The Sanctus Prayer. A good resource for vocabulary drilling is this new resource I found in The Old Schoolhouse Magazine article. FYI I read The Old Schoolhouse Magazine(Homeschool Publication) for free using an App download on my Droid technology smartphone. I think they have it available for iphones as well. But the resource is called Flash Card Machine. I searched Prima Latina and someone already did a series of flash cards for the lessons we needed. So I just used those. They can quiz and test themselves right there on the website. They have an App version for this also but it cost whereas the website is free. You can make virtual flashcards for anything you need. You can even add pictures and clip art. Here is the video for the song for this weeks. 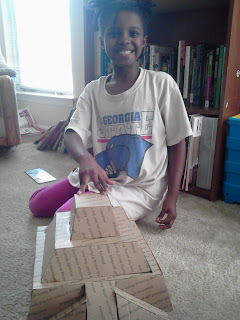 We also did a project this week that went along with the Geography. 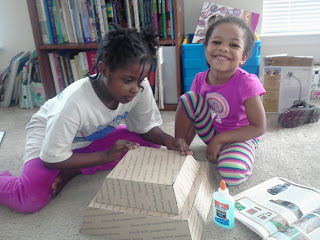 We made a Mesopotamian Ziggurat. We got the instructions for the craft from a library book we checked out called "Passport to the Past Mesopotamia" by Lorna Oakes. We used recycled cardboard from some flat rate shipping boxes the post office sent to us for free a few months back and we never mailed anything out with it. Here is a video of the finished product. This week we did Janice VanCleave's 201 Awesome, Magical, Bizarre, and Incredible Experiments #54 and 56.Experiment #54 was called Telegraph Lines. The purpose was to determine how a spider evaluates the size of an intruder. We also got to observe a web that was outside on our patio. So that was pretty creepy. lol! Here is a clip of doing #56 Belly Up which purpose was to determine why dead fish float, belly side up, on the surface of the water. This week theme was Mirror Image. I found some great warm up sheets on mirror image at Donna Young's site and on Enchanted Learning. Here are the young artist at work. The Project was to do a Still life of some objects. The mirror warm up helped them to focus on looking at the symmetry of objects to make sure they draw both sides evenly. We also keep reinforcing the previous exercise on the 5 basic shapes to help them to draw there still life as well. We got to visit an Art Gallery as well this week so that was another hands on that we were able to add. We tried to point out the 5 basic shapes in the work we saw. They really learned a lot. I've considered CC - it looks like fun. We've never made the jump though. We have attended 2 different CC open house sessions. And although very impressed with the program it was not economically nor time commitment wise feasable for my family. I lucked up and was able to purchase the 1st edition foundations guide the year the new edition came out for $15. So using the techniques at home has been fine. We used it mostly as summer homeschool. I didnt find any time to fit it in during the school year with all our other things. But I think it worked great to keep them learning over the summer.